A friend of mine in Chicago once mentioned to me that she liked living beside a large body of water like Lake Michigan because it allowed her to feel small. I don’t think she meant it in the sense of insignificance, but in the sense of being humbled in the face of the immensity of that-which-is-not-you-but-relates-with-you. I like water. No, actually, I love water. I like the way that water is always moving, even when it’s still. Water reminds me that hope is possible. I find water helpful for reminding me that nothing is fixed, nothing is necessary, nothing has to be the way it is. That remains a very difficult idea to carry around with me, when there are so many people going around declaring that so much is fixed, so much is necessary, and so much has to be the way it is. I’ve often made such declarations myself. Difficult or inconvenient the idea may be, but it remains helpful, indeed, so helpful that it pretty much provides the support for my understanding of hope in the world. Some people might take that as an invitation to be a doormat, to submit to people, to subordinate yourself to situations. But I don’t think that’s what he was on about. I think it was about flexibility, about appropriateness-to-context, about being aware of changing conditions, about being more fully present. The structure of the final section of Bruce Lee’s movie Game of Death unfolds these principals in narrative form through various fight scenes, as Lee adapts his fighting style to the distinct styles of each fighter he encounters on his way up the tower. While I may not be the greatest fan of oppositional fighting styles in martial arts, the movie for me provides a strong reinforcement of the key principle of fluidity and adaptation, key values in how I wish to think about gentleness. When water is restricted it eventually becomes stagnant, unhealthy, unwelcoming, toxic. But even when water is stagnant it remains fluid. Nothing has to be the way it is (though it’s important to understand how things happen to be). The elimination of uncertainty ethos is what drives the cancer of “enclosure” at the heart of organisational practice. Enclosure is the accelerative and intensifying process in play when good organisations go bad and when bad organisations get worse. When left unchallenged, enclosure spreads, it deepens, and it corrodes the core cultural supports of your organisation, among them productivity, employee engagement, creativity, and trust. When this happens, it is “business as usual” that makes the unhelpful difference. 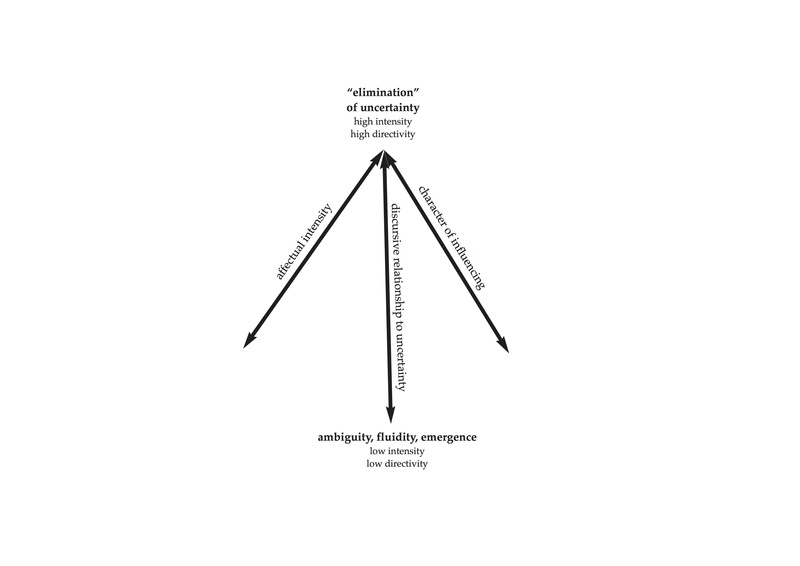 Following the principles of the Cultural Climate Framework, an enclosing cultural climate comes with what I call the Organisational Enclosure Triad – an environment saturated with the elimination of uncertainty ethos tends also to be characterized by chronic heightened intensity, and by chronic heightened directivity. While there are many more features of enclosing cultural climates, these are the core drivers of unhelpful change within an organisational culture. These features, more than any others, are what will most affect the relational climate of the organisation. One the difficulties within a business environment is that the three elements of the organisational enclosure triad are frequently to be found in the heart of workaday orthodoxy in accepted business practice. The logics of the triad are embedded within the language, habits, norms, and rules of much standard and recommended business practice. The challenge isn’t eliminating the presence of these elements, but in minimising their impact within the workplace. It is important to note that while the “elimination” of uncertainty is to be avoided, the reduction of uncertainty is to be welcomed. Similarly, while chronic heightened intensity is to be avoided, occasional intensity at appropriate times is to be welcomed. And while chronic heightened directivity could lead to all sorts of problems, occasional directive strategic interventions might sometimes be very appropriate. It’s about avoiding the extremes of elimination, intensity, and directivity without throwing out the baby with the bath water. The most valuable tool in culture change is a more subtle understanding of how social interactions happen, especially those of a non-organisational character. Any organisational culture comprises an infinitely rich context of habits, gestures, norms, rules, learned behaviours, aversions, attractions, fears, hopes, language, beliefs, memories, expectations, values, and many other dimensions of being human. Making sense of that level of complexity in a relational field calls for a fine balance between respect for specificity, situation, and relationship and the formulation of appropriate generalisations with which to make sense of the sea of specificity. Without adequate regard for the specificity of people’s lives, the generalisations we come to might achieve the status of harmful fictions; without appropriate generalisations, the level of detail and description could leave us with a mountain of information and no guidance as to what we might do with that information. The most crucial aspect in the analysis of cultural climate, then, is the identification of appropriate variables on which to focus the analysis. How, why, and with what consequences do patterns of attitude, behaviour, and social interaction in an organisation vary from situation to situation? What are the general principles which govern variations in thinking, feeling, and doing from situation to situation within an organisation? How do you gauge a particular cultural climate in a way that allows you to compare it with a future cultural climate so you can track culture change? If effect, what I’m looking for is a dynamic map, not of what human nature is, but of what it can be. Discursive relationship to uncertainty (“the head”), from the ‘elimination’ of uncertainty to acceptance of ambiguity, fluidity, and emergence. These variables allow us to make specifically grounded and appropriate generalizations about the governing dynamics of human interaction within organizational environments. The most important point in this work is that I have found these three variables to be direct correlates. For example, the more intense the affectual environment, the more appropriate directive influencing becomes, and the more ‘elimination’ of uncertainty thinking is likely to dominate within the situation. Likewise, the more ‘elimination’ of uncertainty thinking is used within a particular situation, the more likely it is that responses will be directive and the environment will intensify. To continue the logic, the more directive the responses within an environment, the more likely it is that the environment will intensify, and that ‘elimination’ of uncertainty thinking will dominate. A core insight of this work, then, is that within any particular cultural climate it becomes appropriate for only certain kinds of thinking, feeling, and doing to happen. “Culture” can be a very confusing term. People use the term in so many ways. At its most empty and rhetorical, “culture” can be used as a catch-all term to express positivity, and aspiration. At its most specific, “culture” can mean the everyday details of our lives, down to the clothes we wear and the food we eat. In the spaces in between, the meaning of “culture” tends to rely heavily on the perspective of the person speaking, and on the richness of their imagination or the restrictions of their personal or political agenda. For me, “culture” refers very simply to what has happened, what is happening, and what will happen. This is deliberately broad – it is important to not automatically exclude anything from our understanding of culture as a general concept. This then provides a comparative baseline, against which it is possible to make sense of the diverse meanings and rhetorics of the term. To what extent does someone’s meaning of “culture” diverge from this broad sense of it? Is a particular understanding of “culture” only limited to what has happened, what is happening, and what will happen in particular classes, groups, places, or artistic forms? Thinking about it all in this way can highlight prejudices, biases, exclusions, politics of distinction, elitism, and sectarianism. Anticipation: this is a future-oriented notion of culture, an invitation to awareness of our own participation in the cultural future of the organisation. Once we ally the notion of “culture” to the discernment and evaluation of the specifics of power, effect, and circumstance it becomes helpful to speak in terms of “cultural climate”, and, by extension, “culture change”. Cultural climate is the key driver of behaviour and expectations within organisations. The most important dimension of an organizational culture might be characterised as its “cultural climate”, or, in shorthand, the personality of an organization. The cultures of organizations differ in the way that each person has a different personality, that is, a dynamic pattern of variation in attitude, behaviour, and social interaction that tends to be consistent over long periods. The better you understand the personality of your organization, the better you will be able to respond to the challenges it faces. To speak of “a cultural climate”, then, is to speak of the dispositional quality of a particular organisational culture, considered in comparison to other organisational cultures or to other times or places within the same organisation. In colloquial terms, the cultural climate of an organisation here means, “what has tended to happen, what tends to happen, and what will tend to happen in a particular organisation (specified by location(s) over a designated time). “Culture change” is the process of actively intervening to change the cultural climate of an organisation, and supporting that process by way of due diligence, due patience, and due care. To effect a dispositional shift in the cultural climate of an organisation takes time. It also takes sensitive leadership. Until the cultural climate, the personality, of the organisation changes, nothing substantially changes. The notion of change can be thrown around meaninglessly so that change becomes a welcome, unconditional good, and eternally necessary. Sometimes the term is used as if change is something other than that which ordinarily happens – change becomes rare and difficult to achieve, making it the sacred preserve of the creative few. In the other extreme, change can be considered ever-present, constant flux inescapable; life becomes so saturated with change and impermanence that little we can do truly makes a difference. Change becomes more meaningful when it is thought of as ordinary, possible, and available in everything we do. Culture change is one of the more radical approaches you can choose to change your organization. Culture change involves identifying, evaluating, and actively changing the personality or personality traits of your organisation so that they better suit the aims, aspirations, and potential of your company, and so they better support the potential and possibilities of everyone in the organisation. At its best, organisational culture change positively affects productivity, innovation, sustainability, and emotional health simultaneously.